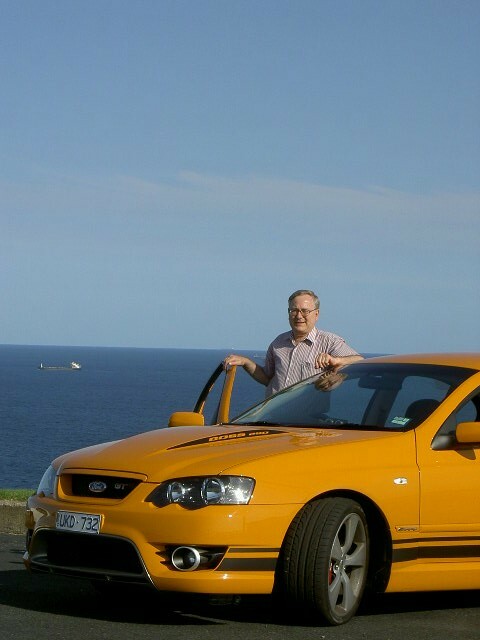 When you think of the Ford Falcon GT it is easy to conjure up thoughts of past great aussie muscle cars. The first Falcon GT was, of course, the now rare XR series GT of 1967. It is a car which you intuitively identify by its distinctive "GT Gold" paint job, a colour which was unique to the original Falcon GT. In those days, the Ford Falcon GT was a factory production model (in small numbers). And it remained a factory production model for some years. Today though, the Falcon GT is a conversion handled by Ford Performance Vehicles (FPV), a partnership between Ford and Prodrive, a well established UK company with a strong background in motor sport. The BF series Falcon, in series II guise, will be replaced very soon by a new Falcon. In the meantime, we look at the outgoing Falcon GT. The test car was the FPV Falcon GT with optional stripes. It was fitted with the 6 speed manual transmission. The colour of the test car was Octane. It is just one of many optional colours. 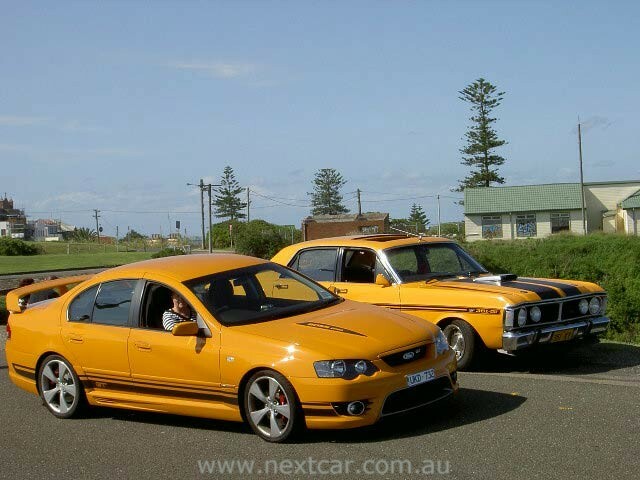 In fact, choosing the right colour is probably the most difficult choice with the highly satisfying Falcon GT. There are just so many attractive colours on offer by Ford. At $62,805 (RRP), excluding options, it is priced for those who have experienced financial success or, as a minimum, financial stability. It is targeted at those who enjoy motoring. The past glories of the Ford Falcon GT make this a prized automotive nameplate that offers much more than a fancy coat of 'war paint'. It's a car which commands respect, simply because of its heritage. It is not the nation's most popular car. It never has been. But it has a certain uniqueness that makes it one of the most interesting. For the experienced and respectful driver, it is as easy car to drive. But for an inexperienced driver it would be a danger. It suits a lazy cruise, with plenty of back-up 'muscle' when a more forceful position is required/desired. The improved front-end of BF Falcons is evident with the Falcon GT. The steering is good, just like the brakes. It's a good firm ride with top handling. The steering wheel has a thickness about it which makes it feel good in your hands. And the wheel adjusts for both reach and rake. Being a Falcon means there is plenty of boot space. Additionally, there are interior hide-away spots as well. The interior is spacious, just as we all expect from a Falcon. But better than that, the interior is 'comfy'. We made numerous trips with passengers and everyone was always comfortable. The firm ride is just as you would imagine with this type of car, but that doesn't equate to harshness. Driving this car is one of the delights of motoring. There is more than enough power to move this machine. The standard six speed manual transmission has a slow gear-changing system, but it is easy to get acquainted with it and you move on and accept it whilst enjoying the drive. The GT has top handling, a good firm ride, a secure front-end, very good brakes and steering that suits a 'muscle' car. Criticism of the Falcon GT is of the most minor nature. The sew-on patch, which Ford considers a driver's foot rest does not do justice to the image of one of the nation's most famous nameplates. May the new Falcon offer a 'real' driver's foot rest. A new Ford Falcon will be with us within weeks. So the final stocks of Falcon GTs are out there waiting for shoppers. 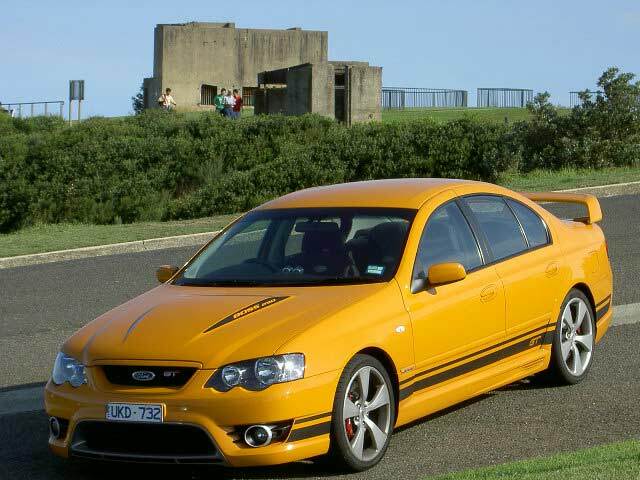 There is no need to beat about the bush, when determining a summary about the Falcon GT. It is a superb drive! But there is one question though. How much is an old Falcon GT worth?